In the latest annual Brand Footprint report, Kantar Worldpanel revealed the most chosen FMCG brands ranking, with global number one held by drinks giant Coca-cola, while Taiwan’s top 10 still occupied by home-grown favourites. 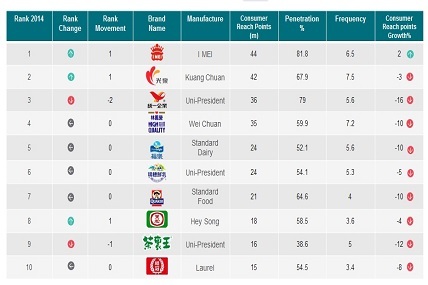 The same brands from last year made their way into Taiwan’s top 10 for 2015, but the ranking has changed slightly, with I-Mei taking down 2-year champion Uni-President to become the new No.1, it is also the only top 10 brands to have grown in consumer reach points (CRP). In its third year, Kantar Worldpanel’s Brand Footprint ranking reveals the brands that are being bought by the most people, the most often, in 35 countries around the world, covering 11,000 FMCG brands across the food, beverage, health and beauty and homecare sectors. The ranking is based on an innovative metric created by Kantar Worldpanel called Consumer Reach Points, which measures every time a consumer chooses a brand. The report also outlines the winning strategies that the most successful global FMCG brands are employing as well as the key global consumer and industry trends. In this latest annual annual barometer of Taiwan’s most chosen brands, Kantar Worldpanel panel revealed that in 2014, I-Mei has seen its products picked an average of 6.5 times a year by 82% of the Taiwanese population. This is equivalent of 6.8 million households, such huge consumer base is biggest of all brands, and no doubt one of the key factor contributing to I-Mei ranking success. I-Mei relentless effort in promoting food safety has also helped grow consumer confidence and loyalty in its range, helping I-Mei to secure top position in the ranking for three consecutive years. In second place is Kuang-Chuan, whose dairy product range enjoyed a stable performance that helped maintained their CRP, and pushed its ranking one place up from last year. Uni-President which is placed in third, had a more unfortunate year with food safety incidents impacting on the two major range: pudding and instant noodle, causing loss of more than 300 thousand households, and ultimately its top position in the ranking. Despite the slip in ranking, it’s top 3 company brands: Uni-President, Chui-Sui and King of Tea all made it into the top 10 ranking for three consecutive years, and is also the company with most brands in the top 10. Finally, in the top 10 other than I-Mei and Kuang-Chuan, Hey-Song’s innovative product lines in SSD has helped increased its penetration, pushing its ranking up to No. 8, and is also the only brand with a growing penetration in top 10. While the top 10 is mostly occupied by food and beverage, leading personal and home care brands Sofy and Kleenex continued to enjoy strong performance with their continual product innovation, making them the only two home care brands bought by over half of Taiwan’s household population. YFY’s paper brand De-Yi is the ranking’s top rising star, growing its CRP by 23%, equivalent of 250 thousand new households, pushing it 16 places higher to No. 41, and the first time into Taiwan’s top 50. YFY’s other major brand May Flower also made it into the top 10 risers, reflecting success of their recent marketing strategies through consolidating retail resources and product upgrades. Other rising stars includes: Taiwan Sugar Corporate, Tai Yen, Chia Nan, and, Super Supau, the growth of these brands reflects Taiwan’s growing need and focus on food safety and sports trend. This year amongst the 500 brands analysed in Taiwan’s ranking, 35% brands are growing their CRPs. Of these, 80% can attribute their success to growing their shopper base (increasing penetration). This is one defining characteristic among all growing FMCG brands. While all the top 10 brands have above 35% penetration, up to 90% of the 500 brands are below this figure, this means every brand still has a lot of headroom to grow in Taiwan’s market. Colgate is the only brand to be bought by over 50% of global population – Growing CRPs by 3% and gaining 19 million new shoppers in 2014, penetration was at the heart of Colgate’s success, showing positive growth in every region across the world. Indian shoppers contribute to at least half of its new buyers, with the brand entering 86% of households in the country. Coca-cola remains number 1 in the global ranking, despite losing reach points. Unilever’s Dove rises into global top 10 for the first time – 9th in the ranking, gaining 14 million new household buyers, whose crusading campaign for real beauty is connecting with consumers emotionally and encouraging purchase across the world. Three of the Top 10 fastest growing brands are PepsiCo’s Lays, Doritos and Cheetos. P&G’s Downy remains fastest riser for the second year running – CRPs grew by 23%, pushing it 4 places higher into global No. 14. Lifebouy has the strongest CRP growth within the top ten, coupled with a 12% spend increase. Master taking the lead for China’s Brand Footprint ranking – the only brand to achieve 90% penetration in China, Want-Want maintains at No.4, while Uni-President falls one place to No.7 at the competition fromShuangHui and Bright.